The world is full of dangers, and mishaps can happen any time and from any source. A less common but just as deadly source of injuries are dog attacks, and one such incident in Modesto, California was reported in Opposingviews.com. 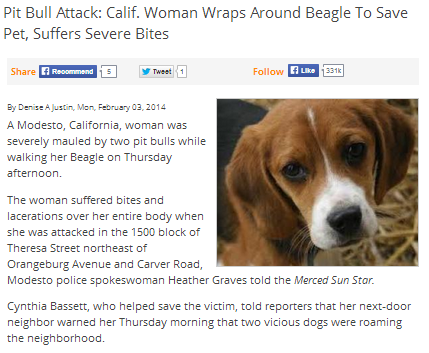 According to the report, a woman who tried to protect her beagle from being attacked by two pit bulls suffered bites and lacerations when the pit bulls turned onto her instead. “The dogs’ owner, Ray Samol, said he was shocked by the attack, which he learned about when he came home from work and found animal control still at the scene. He said that his dogs never have been violent and that there was no hole in his fence when he left for work Thursday morning. Dog attacks can affect a victim in more ways than just the injuries they inflict. In many cases, the victims are also left traumatized and distressed. For this reason, victims of dog attacks and dog bites are often entitled to compensation for both the injuries and emotional distress that they suffer. Elk Grove residents who may find themselves in a situation like this should seek the assistance of noted Elk Grove personal injury lawyers in pursuing their due compensation. The issue of who is at fault in dog bite cases is always clear-cut, particularly under California laws. While a victim may be considered partly responsible if he or she knowingly or unknowingly provokes a dog to attack, the ultimate responsibility always lies on the dog’s owner. Owners should be responsible for their pets’ behavior at all times, especially if the dog’s breed is considered more dangerous than others. Experienced Elk Grove personal injury attorneys, such as those practicing at the Carter Wolden Curtis law firm are well-versed in the legal matters relating to dog bites, and can help their clients in understanding and fighting for their rights.